Welcome to the debut of PokeStats's new Deck Power Rankings! Last season, I ranked decks based on a set of algorithms I created that accounted for previous meta presence, finishes, and upcoming cards/expected techs. However, these formulas ultimately fell short of the accuracy I hoped to achieve, so for this new season, I'm trying something different. My new system is similar to the way ESPN does their Power Rankings of sports teams (most notably the NFL): prior to every weekend's (or major tournament, in Pokemon's case), dozens of NFL experts are asked to rank the teams from best to worst. Point values are assigned to each team in each set of rankings, and the points are averaged out to create the final rankings. My system works in a similar way. For these first rankings, a fairly small sample of top players was interviewed, although I plan to increase this number for future rankings. I simply asked each player to list their top 10 decks for Fort Wayne Regionals, gave the #1 decks 10 points, #2 decks 9 points, and so on, and then simply added the points together. 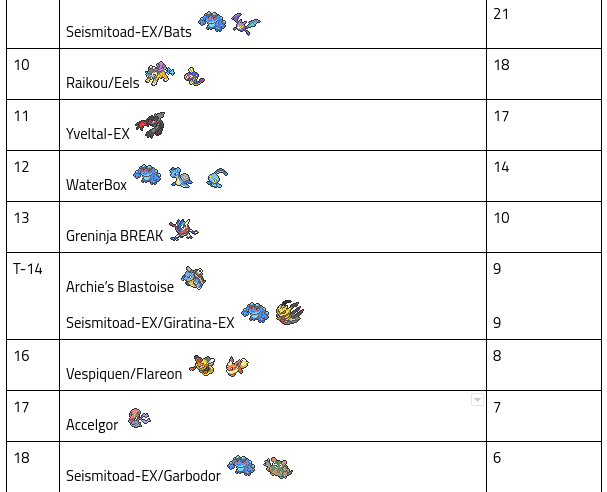 So without further ado, here are PokeStats's first Deck Power Rankings of the new season - hopefully an accurate representation of what decks should be expected at Fort Wayne Regionals! The first thing that stood out to me was, of course, the tie for first place! Some players considered Trevenant the best deck and others claimed it's Darkrai, but both decks (as well as Night March) were always highly rated. (Night March was almost always behind the other two.) 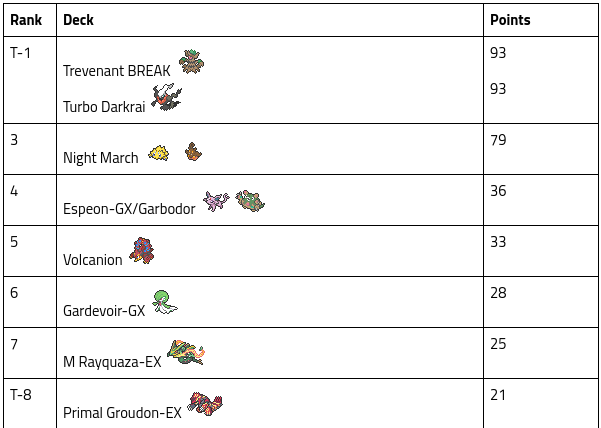 However, Trevenant never fell outside the top 3 in any individual player's rankings, while at least one player had Darkrai outside their top 3. Darkrai, Trev, and Night March make up a clear trio of top decks, with Night March having over twice as many points as the 4th-ranked deck, Espeon-GX/Garbodor. One of the stories to watch in Fort Wayne is how well Garbodor decks translate to Expanded. Expanded is an Item-heavy format and it will be interesting to see decks adapt. The Charizard Lounge's Andrew Wambolt also pointed out that Espeon/Garb and Drampa/Garb will bring Garbotoxin back into Expanded, where it's been largely unseen at recent events. This could be problematic for some decks. Slightly behind Espeon-GX comes a trio of heavy-hitting decks: Volcanion, Gardevoir-GX, and M Rayquaza-EX. The first and third of those have proved their worth in Expanded before; Gardevoir is the newbie, but there seems no reason why its success in Standard cannot translate over to Expanded. Primal Groudon sees a slight decrease in favorability with the popularity of Turbo Dark (a deck that surprisingly has a decent Groudon matchup according to many players) and Gardevoir-GX, which can one-shot Primal Groudon with relative ease if it can get around Focus Sash. Seismitoad decks are probably going to be played in a variety of ways; the most popular with the players I interviewed was Toad/Bats, but Garbodor, Seviper/Lasers, and Giratina-EX all seem to be worthy partners as well. Toad is a bastion of the Expanded format and I'm fairly certain it will crack the top 32 at Fort Wayne, and maybe go further. 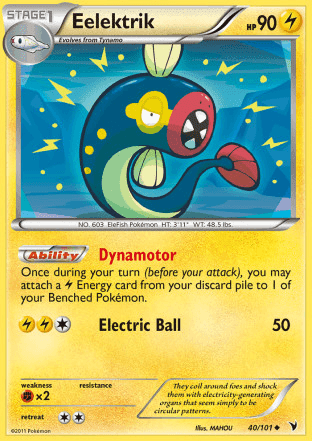 Rounding out the Top 10 we have Raikou/Eels, a deck which Chris Schemanske profiled on SixPrizes recently and which gains some new tricks such as Eelektross BSH. The deck only cracked the top 32 three times last season, but every time it did so, it performed well, with Andrew Mahone piloting it to 18th place and Michael Slutsky and Sam Chen both taking it into the Top 8. The ban of Archeops is extremely beneficial for Eels decks, and the fact that fewer decks will likely be playing Maxie's engines is another plus. Eels also tends to go favorable against Trevenant (using Rough Seas) and Night March (using Karen and keeping up in the Prize trade). The decks outside the Top 10 are a mixture of old Expanded archetypes (like Blastoise) trying to revive themselves with new cards; and new Standard decks (like Golisopod-GX) translated into Expanded. There are some decks, like Yveltal-EX or Greninja, that saw Expanded success last year; it remains to be seen whether they will succeed at Fort Wayne, but no player I interviewed thought particularly highly of either deck, with a few exceptions who were fans of Yveltal. Also note that Accelgor is largely considered dead in Expanded with the rise of Acerola and Guzma - however, one player I interviewed ranked the deck quite highly, hence its 7 points above. One thing is certain: there is a very clear "big three" (and to some degree merely a "big two") to watch out for at Fort Wayne. 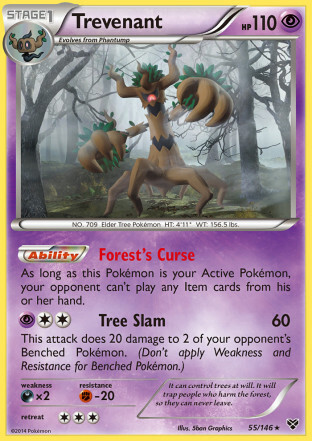 Your deck either needs to be Trevenant, Darkrai, or Night March, or it needs to be able to beat those decks. There are plenty more viable options, and Expanded may well be on its way to being an enjoyable format because of them, but we'll have to wait until the tournament's conclusion to see where we really are. PokeStats will be covering all the action from the year's first Regional live on Twitter, so stay tuned! Thanks to the following players for contributing to these rankings: Alex Hill, Brad Curcio, Christopher Schemanske, Connor Finton, Jose Marrero, Mike Fouchet, Peter Kica, Rahul Reddy, Ryan Sabelhaus, and Zach Lesage.